【Composition】: Set of 12 Highlighters of 12 Vivid Bright colors. Meet all your notetaking, underlying and drawing needs. 【Material】： Special gel highlighter glides smoothly across page and won\'t bleed through any paper. Also doesn\'t smear other inks when highlighting over them. You don\'t need to worry about the dried-out or run out fast. Long-lasting gel stick promise you a great using experience. 【Safety】: Eco-friendly and non-toxic tip. Odorless and Well-design cap prevent the tip from drying and completely harmless to health. ATTENTION, keep it far away from your kids under 3 years old. 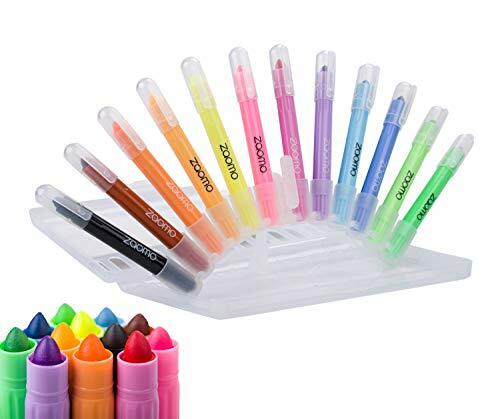 【Unique Packing Box】: Distinctive Pen-Holder design make you easy to pick the particular color and change another one. At the meanwhile, it looks Fancy and Striking. Children even adult may love it much. 【Multifunctional】: Highlight Bibles for emphasis on Meaningful Words, Phrases and Passages. Also safe for highlighting on any paper surfaces like study, text and legal books. While it is a good idea to paint with these Bright Gel Highlighter. Using your Art to Make Art.